In its article on 11 September 2012, immediately after the LNP government handed down its first budget, our beloved Cairns Post described Lake St as “ Cairns CBD’s troubled thoroughfare”. Funny, I thought there was a pedestrian Mall in the middle of it. There’s $5 million in the budget … to do what? Member for Cairns Gavin King speaks only about “the project”. On his facebook page on 9 September Gavin said “Details of what the project will be, and what City Place/Lake St will look like are up to council and the community.” Gavin’s personal opinion is to “open up” City Place to traffic. Whatever the project is, he wants it built by mid-2014. Mayor Bob Manning calls it “a major foundation stone project to commence the enhancement of our CBD.” He and Deputy Mayor Terry James have said previously they prefer a City Place which is “opened up” to traffic. So far no politician or Councillor has come out and said openly that they are going to turn City Place into a busway. The incompetence and arrogance of Queensland Transport is one reason the Labor Party was turfed out of office earlier this year. The destruction of City Place was decided upon by Queensland Transport in the absence of consent from Cairns residents. In many cases it was done despite citizen opposition. Gavin King and Bob Manning MUST do better with $5million than waste it on the futile third rate option given to them so far by Queensland Transport. The citizens of Cairns MUST ensure our new politicians are effective and accountable. Right now the bus-way proposal already developed by Queensland Transport is the default setting for this $5 million project. We need a better option… one that’s ready to go. 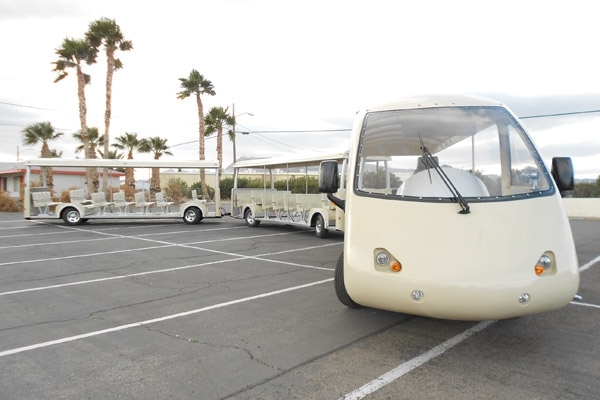 For $5 million we can build a CBD trolleycar service, a City Place restored to the design that we know works, and have $2 million left over for Grafton/Shields St.
prefabricated electric trams, available off the shelf. Imagine what they'd look like after local artists and musicians got to fit them out. What do we want for Cairns? Do we want a distinctive and effective CBD in which pedestrians are free to explore and enjoy our relaxed tropical city? 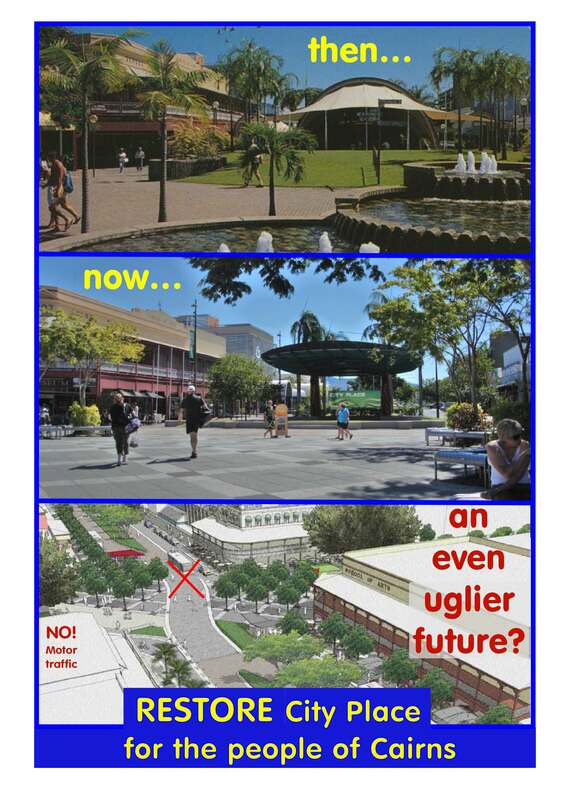 Or do we want a dreary busway through our only town square because it’s already been designed by Brisbane bureaucrats? As Gavin King has said, “Details of what the project will be, and what City Place/Lake St will look like are up to council and the community”. No buses or motor vehicles through Lake st. Main Bus Terminal should be near Railway Station ( A transit centre) Smaller electric buses for movement through Esplanade to Sheridan bound by Aplin to Spence. Take all garish advertising hoarding out of main CBD area. Restore facades of substantial older buildings, Hides, Central Hotel, Mazlin’s building and Palace Theatre (Boland’s building sets the standard). Any advertising signs should be of a consistent uniform design. Wide overhangs of buildings should be returned once large vehicles like buses are taken out of this area. No vehicle should be allowed in the area of Lake st bound by Aplin and Spence st and the area of Shield st bound by Grafton and Abbott St. All bitumen should also be removed from this area and gardens with shady trees installed in its place. Food venues should then be able to use garden space and buskers encouraged.